The U.S. must have been a different place back in 1941, because these words of freedom helped to inspire the “Greatest Generation” to soldier-through the years of misery which soon engulfed the nation. Only a few months after his speech, the U.S. entered WWII and today's world was born of the chaos, destruction and loss of millions of lives that soon followed. Democracy seemed to work then. But in 2016 our democracy is not the same as our parents'. There is no doubt that our government is working for the very wealthy. But, it is not working for me and most likely it’s not working for you either. 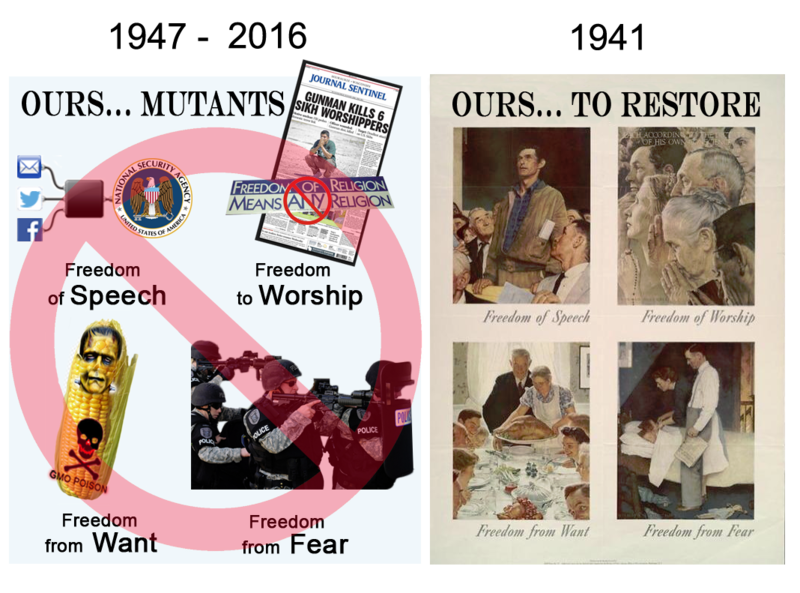 Our four freedoms have metastasized into the exact opposite of our parents’. “Free from want” has turned into a Frankenstein monster. Not only have Americans been turned into a nation of sugar addicts [On average, Americans annually consume, 45.5 Lbs of sugar and four gallons of high fructose corn syrup loaded junk food. (3.)] by our government in order to fatten corporate coffers, we are now guinea pigs, subject to an endless stream of genetically engineered food products. It’s sadly mind-boggling to know that not one governmental agency has conducted research as to the long-term effects of genetically engineered food products on humans. What does that portend for us? Consider Monsanto’s “Roundup Ready” crops which are engineered to be herbicide-tolerant. They now account for about 75 percent of all the corn and cotton grown in the U.S. and 90 percent of soybeans. According to Michael Pollan, award winning journalist, food and food industry expert (Pollan is also professor of journalism at the UC Berkeley Graduate School of Journalism and the director of the Knight Program in Science and Environmental Journalism. He is the author of many books, four New York Times bestsellers and hundreds of articles, and a contributing writer to The New York Times Magazine) — “Roundup Ready” genetically engineered corn does not increase crop yields, but it sure does produce herbicide-resistant weeds, prompting farmers to use more and stronger herbicide sprays. And, that causes a slew of “collateral” damage to adjacent crops, wildlife and ultimately humans, too. (4.) Please see below, "What is this STUFF? Agent Orange is Roundup Ready". Since Monsanto forbids family farmers from saving Roundup Ready seed corn for next-season planting, farmers are locked into a never ending cycle which not only ensures fat profits for Monsanto but guarantees that we have no choice but to eat Frankenstein-corn. World-wide, for farmers and consumers, “forbidden to save seeds” means it’s become more difficult for people to feed themselves. Some see "Freedom of worship" as a foundation of America. However, American freedom of religion actually translates into: It’s O.K. for you to practice your religion as long as it’s similar to mine — in my eyes. If, for instance, you wear a turban, a veil, some form of garb or dress, display facial hair or the hair on your head in an unusual way — then you may stimulate a visit form the current version of the KKK — the FBI, the IRS, the CIA, or some mentally disturbed person who sees your difference as proof that Satan lives within you. Even worse, perhaps if you actually believe in walking Christ’s path, well, then, that really makes you the ultimate threat to the establishment. In The Fight for the Four Freedoms What Made FDR and the Greatest Generation Truly Great, historian Harvey J. Kaye, has correctly concluded that today Americans need to take personal responsibility to right the injustices which are now metastasized throughout our society. But throughout his book Prof. Kaye also makes another important point: it was President Franklin D. Roosevelt who made the wheels of government work for all Americans and not against them. FDR not only faced the Republican obstructionists and regressives of his day, he out foxed and overcame them. And rather than surrendering before the battle began, he went to the American people with new ideas, plus — and most importantly — the means and the courage to achieve them. FDR became the leader we needed when we needed him. Compared to the current candidates for office of President of the U.S., there is no comparison (save for the usual Republican obstructionists to obsess upon). FDR actually did what he said he would do; our leaders in waiting appear to have failed us even before taking office. History will be the judge, of course. But the truth is, we have no national leadership at a time when we need leaders who will actually represent our interests as human beings. So it falls to us to do the job, fill the void, and set our priorities to restore the freedoms we have lost. 1.“Chris Hedges Capitalism, Not Government is the Problem,” Truthdig / Op-Ed, Truthout, Chris Hedges, 5 May 2014. Download a PDF version here. 2. The 9/11 Decade and the Decline of U.S. Democracy, Vincent Warren, Executive Director, Center for Constitutional Rights, 7 Apr 2014. Go here for a PDF version. 3. “Is Sugar Toxic?,”The New York Times Magazine, Gary Taubes, 13 Apr 2011 Download a PDF version here. 4. "A Journalist and a Scientist Break Ground in the G.M.O. Debate," The New Yorker, Amanda Little, 25 Apr 2014. Go here for the PDF version. 5. Go to the Center for Food Safety or Center for Food Safety January 2014 Fact Sheet, “Agent Orange” Crops: The Next Stage in the Chemical Arms Race”. Download the PDF version here. What makes a leader? I've been working on a project about what makes an excellent leader and revisited a book written by Douglas Brinkley, The Boys of Pointe Du Hoc. While some of the text is devoted to Reagan’s 40th D-Day Anniversary speech and his speech writer, Brinkley described the history of the Army Rangers and their role in taking out the big guns at Ponte Du Hoc during the D-Day invasion. When I heard Brinkley recount the story of the Rangers scaling the cliffs and the terrifying loss of men, 70% I believe, I also remembered reading Cornelius Ryan’s, The Longest Day, in which he said, when the few surviving Rangers took the gun emplacements they found them empty. Ryan never found out the rest of the story: the Germans had only pulled the guns out of their emplacement and moved them back away from the shore in order to avoid the allied bombs and naval gun fire. They were simply waiting for the best time to bring them back into position and then open up on the landing fleet. What stopped them from doing that? 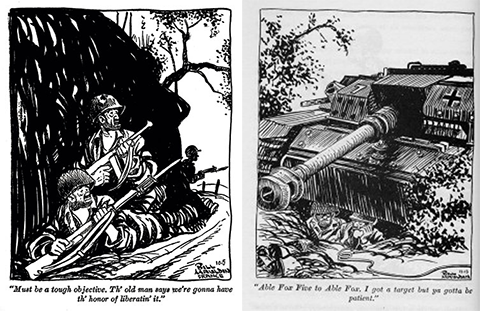 During WWII Bill Mauldin's Willie and Joe told the GI's side of the story. I submit that everyday GIs also exhibited the very best of leadership qualities... they actually got the job done… like the GIs of Pointe Du Hoc. They did what needed to be done out of a sense of duty, their shared camaraderie, a will to survive and a compelling need to just do the right thing. That quality is inherent in all of us, except for most of the members of the U.S. Congress. Captions above: "Must be a tough objective. 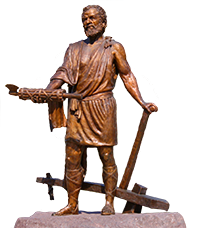 Th' old man says we're gonna have th' honor of liberatin' it." "Able Fox Five to Able Fox. I got a target but ya gotta be patient." Brinkley discovered that a couple of sergeants survived the battle for the emplacements. When they discovered them empty, they still went on to complete their mission, which was to disrupt German communications and interfere with troop movements behind the gun emplacements. They had only 11 men but moved out anyway. Soon they discovered heavy equipment tracks leading to an apple orchard. They followed them and found the “five camouflaged guns in ready firing position with ammunition piled nearby”. Somehow the gods of war were kind that day because the German crew and defenders were clustered away from the guns at such a distance that the two sergeants were able to disable them with the thermite grenades that they and the others were carrying. For me this story underscores what our military does do right most of the time: empower all of our people with a “can do” spirit to complete whatever mission is assigned and train them to use their minds and ingenuity, stay alive, and get the job done no matter what it takes - no matter one’s rank. Earth knows. That's why she called you. One of us, the everyday Joes and Janes, will get the job done. Please consider starting your Encore Boomer Movement group in your hometown... there's no money envolved. Together we will get the job done.